Kids bean bag is produced to make children's rooms clean and neat: without toys, towels, blankets, seasonal clothing scattered around the house and lied about. Animal beanbag chair is made of high quality, durable and soft premium cotton canvas. Large animal bean bag easy to store, does not occupy much space, easy and quick to clean. 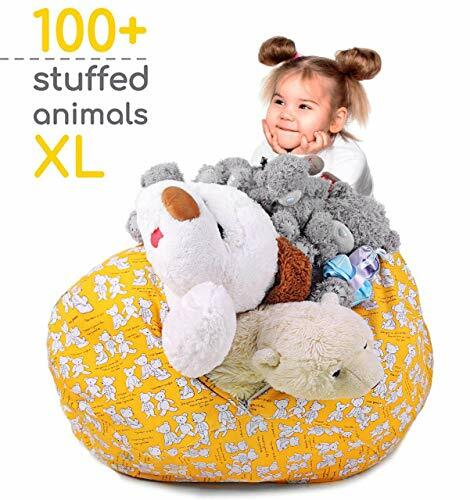 Thanks to significant XL size soft animal storage can accommodate up to 100 plush toys of medium size. Modern styling with colorful designer prints plush toy organizer is made to fit into any fashionable interior and will be the highlight of your stylish and modern house. Unique print with polar bears toy bag can be used as a coloring book for your kids, thanks to it your child will develop his imagination and creative skills. Very comfortable and very long lasting zipper will help your child to collect things in premium bean bag and find any toy easily. Bean bag animal toys is great for storing toys, towels, clothes, blankets, bedspreads, pillows, covers, stuff animal, and much more. You may not worry about the health of your children when they are playing or using a toy room storage because it does not contain harmful chemicals, lead, cadmium, and phthalates. Stuffed animal storage thanks to its unique design, bright coloring, impressive multi-functionality, and high-strength materials will be a great gift for Christmas, birthday or any important event! HIGH-QUALITY ANIMAL BEAN BAG - Our kids toy storage is made of durable, soft, long-wearing and high-quality premium material consist of cotton canvas (65%) and polyester (35%), which can be easily cleaned. STUFFED ANIMAL STORAGE - GIANT BEAN BAG. Really great size (110in X 38in) so you can quickly clean up even a large children's room with lots of plush toys of all sizes and put up to 100 toys into this kids storage. KIDS BEAN BAG - Unique Design. Toy holder has bright, unique design prints. It has a comfortable and durable handle with reliable zipper, thanks to your child can move the large bean bag easily and find any toys quickly. ALWAYS CLEAN ROOMS - Stuffed animal storage will teach your child put and not throw around his stuffed animal, plush toys and etc. It can be used as a beanbag chair for watching TV or reading. GREAT TOYS STORAGE - Ideal kids storage for towels, stuffed animals, plush toys, pillows, covers, blankets, seasonal clothing and much more. Children can sit on this bean bag chair, beat it like a punching bag and think up a lot of games. If you have any questions about this product by Zupo Crafts, contact us by completing and submitting the form below. If you are looking for a specif part number, please include it with your message.